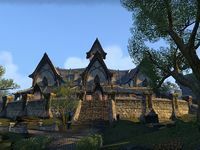 The Thalmor Headquarters is a guildhall housing Thalmor representatives as well as the Fighters Guild and the Mages Guild branches in Woodhearth. It is a spacious Altmer-style two-story building located in the northern part of the city. Each faction occupies different chambers. There are five bookshelves in the guildhall. Some personal reflections, Mercano's Journal, and a note, A Complaint to the Thalmor, can be found on the ground floor. A lore book is upstairs. All fireplaces in the building can be used for cooking. There can be a safebox in the Fighters Guild quarters. Thalmor Headquarters — Thalmor's base of operations in Woodhearth. Several Dominion Guards patrol the premises.